Have only seen one other example of my necklace and it was on eBay for over $400.00. 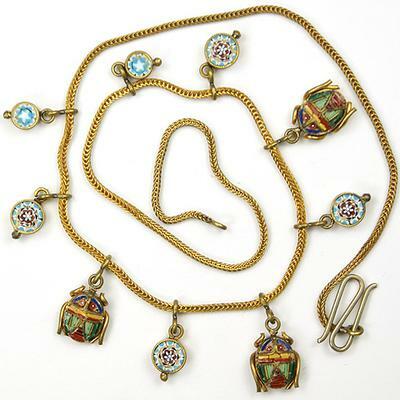 It is a Necklace consisting of 3 Scarabs and 6 rosettes of the micro mosaic or Pietra Dura style, I am not sure. The only other example I could find looked alot newer or else had alot less wear/ Gold plating still intact. But the one common denominator other than the style looking almost exact to mine is (FAP) marked on the back of one of the rosettes. I had always thought it was brass but now I do not know. Any help with the origin/maker or the date would really help. The only one I found that's pretty exact to mine quoted their info from a book by michael poynder called: Price Guide to Jewellery (London, 1981), p. 197. Thankyou for any help. Mine is just like the pic I uploaded just looks more worn like brass.